This will also look wonderful on long hair :)! Kayley – when you tease the bottom of the braid to hold it in place, will that not cause more split ends? Keep doing more short hair styles please, I love your hair styles but I have short hair. Thanks for all these super cute hairstyles for short hair! I do my sister's hair a lot, but she has short hair and I don't, so I don't have much experience with it. But your videos are very helpful and give me some great ideas! I just got my hair cut short and very similar to this too!! It looks beautiful on you by the way… Also I was just wondering if you could make a 20's finger waves video for short hair. Like a way you could bobby-pin your hair to get finger waves overnight? I think that would be really pretty and a lot of people would enjoy it. 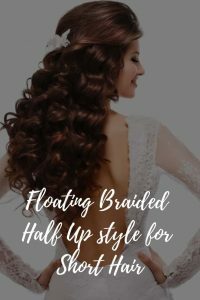 So a Dutch lace braid? I`m Egle from Lithuania and I'm 18 years old. Since I started watch youtube videos, you was my greatest inspiration for hairstyles and when I do your inspired hairstyles for myself, I always get compliments. Now I`m in trouble. On Friday I will go to my prom and I can`t find perfect hairstyle for myself. I want side swept curls, but with something interesting. So, I decided to ask you. Maybe you could help me? Please, I need your help! p.s. my hair is long like yours. Could u do a vid on how to curl short hair! I'm so happy you're doing shorter hairstyle looks! Hi Kayley! I'm getting married in June and my hair will be about this length by then. Could you show a full up do as I'm dying for some ideas I can actually use! I love all your videos and wish I had your length to do most of them!! Thanks! Really cute look! I have about the same length hair but much thicker. It is actually curly but I straighten it. Loving these shorter hair styles! Please keep them coming!!! That's soo cute and absolutely perfect for my short hair! Is the braid able to stay in place by just back-combing the end of it? Really like that you're doing more short hair tutorials! I love this series! My hair is more medium length (right ast my armpit is the best way to describe it) but because I have shorter layers too, I can't do side braids and some curl patterns just look awkward on me. Please continue this series! Thanks for teaching me everything I know about hair! Can you start listing what nail polish you have on? You always have pretty colors! And I'm loving Februhairy! Could you do a classy work updo for short hair? Something with braids that I can do quick-ish before i gotta jet. Can you do a braided style for short hair on an older woman? As a 30 year old, I cannot wear my hair like that especially to work. Something more professional would be great. Thank you.